Two members of the Wake Audubon Society board, Colleen Bockhahn and Erik Thomas, conducted bird counts in the Lumber River Important Bird Area (IBA) on May 1 and 2. IBA’s are areas that provide especially extensive areas of prime bird habitat and may harbor uncommon or rare species. Audubon North Carolina has entrusted the Wake Audubon Society with monitoring the Lumber River IBA, which covers much of the eastern half of Robeson County. Designated points are established at which the counts take place. Counting follows a protocol in which counters record the numbers of each species they see or hear within a ten-minute period and approximately how far away each bird was from the point. WAS members have been monitoring the Lumber River IBA for the past nine years. was ubiquitous. Yellow-billed Cuckoos, Acadian and Great Crested Flycatchers, Pileated Woodpeckers, Barred Owls, Red-shouldered Hawks, and three species of vireos were frequent. We heard Swainson’s Warblers at three different count points. Even a few Wild Turkeys materialized. Perhaps our biggest surprise was a Wood Stork that was soaring overhead at one count point. One species that we did not find was the Red-headed Woodpecker, a bird that has appeared on many of our previous trips to the Lumber River IBA. Our total for the IBA on this trip was 73 species. The records for all of the point counts are entered into a website that Audubon North Carolina keeps. Although this website is not publicly accessible, we also entered all the counts on eBird, so if you’re curious about what species we found at each site, just go to the eBird website (http://ebird.org/content/ebird/), click on “Explore Data,” and click on “Species Maps” to see any species or “Explore Hotspots” to see any of the individual points, which are designated as “Lumber River IBA D-01,” “Lumber River IBA D-02,” etc. The Raleigh Christmas Bird Count was held on December 19, 2015. It was clear and chilly…a marked change from what had been an extended mild autumn season. Sixty-seven participants were distributed in twenty teams scattered across the top birding spots in southern Wake County. Our Raleigh Christmas Bird Count has taken place in this same 15-mile diameter circle since 1937. The Count Circle center is at the Farmer’s Market along Lake Wheeler Road. This year we had groups owling at Schenck Forest, Mid-Pines and Lake Raleigh; and one pair of intrepid birders took a pre-dawn paddle into the upper reaches of Lake Benson. Most groups assembled around 7 am and birded through the morning. For those who could make it, we got together for our mid-day Countdown at Yates Mill Pond County Park. All told we tallied 99 species of birds for the Raleigh Christmas Bird Count- a pretty good count for our area these days. Years ago the Raleigh CBC would regularly top 110 species, but nowadays we hope for 100. 1 Red-necked Grebe seen by boat at Lake Benson, 3 Redhead Ducks at Lake Wheeler, 1 Northern Harrier at Schenck Forest, 1 Horned Lark and 40 American Pipit along Mid-Pines Road, 2 Common Raven at Umstead State Park, 1 Blue-headed Vireo at Walnut Creek Wetland Center, and 1 Orange-crowned Warbler at Lake Raleigh. The American Bittern made an appearance at Prairie Ridge Eco-station, and an incredible 11 Bald Eagles were seen at various locations across the Count Circle. Other notable species which may have lingered in our area during the warm fall weather include: 2 House Wren, 1 Gray Catbird, 2 Palm Warbler, and 1 Common Yellowthroat. A total of 11 Fox Sparrow (mostly at Schenck), 3 White-crowned Sparrow, and 13 Rusty Blackbird were also seen. In addition, 12 Baltimore Oriole, most at Lena Gallitano’s feeders, were tallied. Winter finches were noticeably absent- only 3 Purple Finches were seen. More worrisome were the low numbers for Loggerhead Shrike (1), and Eastern Meadowlark (7). Bobwhite Quail may have disappeared from the count circle entirely. Perhaps the oddest miss was for the Fish Crow- the first time in many years where none was reported. Of course years ago the species was very rare here. Not to worry, they are now a common breeding bird and as I finish writing this post I can hear some outside my office window. The Raleigh Christmas Bird Count was held on Saturday, December 19. After an extended warm spell, Saturday was clear but seasonably cold with early morning temperatures below freezing, and the wind picked up as the day advanced. Twenty-one groups with more than 70 participants surveyed the same southern Wake County parks, reservoirs and farmlands that bird counters have been visiting since the Raleigh Count was initiated in 1937. As compiler, I organize the group leaders and assign participants before the count, and then I tally and submit the results to a national database afterward. I haven’t received all the count tallies yet, but preliminary results list 95 species of birds sighted by our groups. Many counters reported low overall bird numbers, and some species were noticeably uncommon, for example, Goldfinch. But diversity and numbers for most species was comparable to other years. Redhead Duck (2) at Lake Wheeler, Northern Harrier (1) near Schenck Forest, Horned Lark (1) and American Pipits (45) at Mid-Pines, Loggerhead Shrike (1) at Schenck Forest, Blue-headed Vireo (1) at Walnut Creek, Common Raven (2) at Umstead State Park, as well as singles and multiple sightings of the following: House Wren, Gray Catbird, Palm Warbler, Common Yellowthroat, Fox Sparrow, White-crowned Sparrow, Rusty Blackbird, Baltimore Oriole and Purple Finch. The best bird of the day might be a Red-necked Grebe that was seen at Lake Benson by our paddling birding team of Kyle Kittelberger and Brian Bockhahn. This might be the first ever reported on our count. Notable misses up to this point include: Northern Bobwhite, Eastern Screech Owl, Herring Gull, Red-breasted Nuthatch and Pine Siskin. Have a happy, safe and peaceful Holiday season. Every holiday season, tens of thousands of volunteers, mostly in the U.S. and Canada, but also in at least 15 other countries, brave cold, rain, wind and snow to participate in the Christmas Bird Count. The data they gather are used to assess the health of bird populations and guide conservation actions. Sponsored by the National Audubon Society, Christmas Bird Counts are held each year between December 14th and January 5th. Their basic purpose is to census bird populations. Each regional count covers a “count circle” 15 miles in diameter, or about 177 square miles. Participants divide into small groups, and each group covers a specific assigned portion of the circle as thoroughly as possible. They identify and count, to the best of their ability, every bird seen during their 24 hour count date. Participants may count birds all day, or for only a few hours. Some prefer to watch their feeders and report those results. Usually one person serves as coordinator, organizing participation, compiling data, and submitting final results to National Audubon. Attitudes toward, and appreciation for, wildlife and conservation in this country have changed drastically over the years. In the 19th century, before there were laws protecting migratory birds, “side hunts” were a popular holiday tradition. Contestants would choose sides and see how many birds and other animals a team could shoot in a single day. Frank M. Chapman, a young ornithologist and early officer in the newly formed Audubon Society, was outraged by this senseless killing and waste of wildlife. In protest, on Christmas Day 1899, he counted live birds for three hours, publishing his results in the newly created Bird-Lore magazine (which later became Audubon), and encouraged other bird lovers to do the same. The next year, 1900, the first national count was held, with 27 participants counting in 25 locations across the U.S. and Canada. Each year since then, the Christmas Bird Counts, or CBCs, have grown. Well over 2,000 regional counts are now held, with over 70,000 participants. About 40 are held in North Carolina. This year’s 116th annual count promises to be the biggest yet. The Raleigh CBC, sponsored by Wake Audubon, will be held on Saturday, 19 December 2015. Contact John Connors jconnors@wakeaudubon.org or John Gerwin jgerwin@wakeaudubon.org if you would like to participate. CBCs are among the best data sources we have on bird populations. They can depict trends and population fluctuations over time. They are also the best-known citizen science projects in the world—allowing ordinary citizens to gather data that contribute to the overall body of our knowledge about birds. The counts certainly have their flaws and shortcomings. Not every part of a count circle can be covered. Certainly not every bird gets seen or identified. Large flocks can’t be counted precisely. It’s hard to be sure that some birds don’t get counted more than once. But the sheer volume of information and the consistency of holding the counts in the same places, during the same seasons, often with the same participants counting in the same fashion, year after year, make the data very valuable. Studies have shown that CBC data correlate closely with those gathered using more rigorous scientific methods. Hundreds of peer-reviewed articles have been published in scientific journals using analyses done with CBC data. State and federal agencies also use the information to make important bird conservation decisions. CBCs are good opportunities to learn about birds from skilled and knowledgeable birders. They are also social events, where birders can make new friends, or spend time with old ones. These are the biggest reasons that many people participate. Many counts have special traditions, including lunches, dinners, and countdown parties during which data are compiled and stories are shared. Some even have their own T-shirts. The Raleigh CBC’s annual potluck dinner, the venison chili and pralines usually to be had at the Southern Pines count, and the Key lime pie and seafood featured at the tally rally following the Ocracoke and Portsmouth counts, will be enough to keep you coming back. But even better are the things you’ll see and learn, and the friends and memories you’ll make. If you don’t know birds very well, you can still be placed with a team of good birders and help by spotting birds for them to identify, or by helping them keep their list. Birding with experts is one of the best ways to learn. Even if you don’t participate in an organized count or project, birding is fun and educational in its own right, and is one of the easiest outdoor activities to get interested in, because you can watch birds anywhere. A pair of binoculars and a good field guide are all you need to get started. And you have all year to learn and practice for those Christmas Counts! Atlas of Wintering North American Birds: An Analysis of Christmas Bird Count Data by Terry Root, University of Chicago Press, 1988. “Out for the Count” by Jeff Beane, Wildlife in North Carolina, December 2006. Join citizen scientists and bird nerds across North Carolina when they direct their eyes to the sky for Audubon’s Great Backyard Bird Count (GBBC) over Valentine’s Weekend. Now in its 18th year, the four-day event is encouraging bird watchers of all ages and skill level to contribute to research and conservation on a global level. The GBBC is for everyone, everywhere! Becoming a citizen-scientist is easy when you count birds for at least 15 minutes on one or more days of the count, and submit your sightings to www.BirdCount.org. And the information gathered by volunteers helps track the health of bird populations at a scale that would not otherwise be possible! The Great Backyard Bird Count is the perfect follow-up to the Christmas Bird Count allowing us to track birds movements throughout the winter months. The data collected by thousands of citizen scientists across North Carolina is increasingly important to Audubon’s work as we develop new conservation methods to protect our birds from the effects of climate change. North Carolina continues to be a top-performing state for the GBBC. During last year’s citizen science event, more than 5,000 checklists were submitted in our state. The largest single species count was 12,000 Redheads at Ocracoke Island, and the most frequently reported species were the Northern Cardinal and Dark-eyed Junco. In total, 204 individual species were spotted during the four-day event. For those bird nerds in need of a fun activity to share with their kids, the GBBC has plenty to choose from! With its less structured design, this weekend event is a great opportunity to introduce children of all ages to the excitement of bird watching. Audubon has created games and activities to help parents engage their kids in the count, and foster a love of citizen science from an early age. With 96 classified Important Bird Areas comprising 4.9 million acres, diverse landscapes from the mountains to the coast, and the state’s position along the Atlantic Flyway migration path, North Carolina is for the birds. And with so many species to spot, our citizen scientists have made NC one of the top performing states in the Count each year. The GBBC continues to grow thanks to integration with the eBird online checklist program. Bird watchers from 135 countries participated in the 2014 count, documenting nearly 4,300 species on more than 144,000 bird checklists. Many fell in love with the magnificent Snowy Owl during the last count when the birds were reported in unprecedented numbers across southeastern Canada, the Great Lakes states, the Northeast and down the Atlantic Coast. Expect Snowy Owls to show up in higher numbers during this year’s GBBC, too. The GBBC is a joint project of the Cornell Lab of Ornithology and the National Audubon Society with partner Bird Studies Canada. To learn more about Audubon’s Great Backyard Bird Count visit birdsource.org/gbbc. This year’s count day brought some of the most oppressive weather, for conducting an outdoor activity! For the most part, it was a very cold drizzle – no amount of shivering under layers of clothing could get us warm. The banter along the path was often about getting back to a car, a bathroom, or “why didn’t I bring those chemical foot warmers?”…….. it required some effort to stay focused on birds, both figuratively and literally. We had to keep wiping off our binocular lenses every 10 minutes because the good news is, we kept seeing birds, constantly. In spite of the rough weather, there were numerous highlights for those who participated. I led a small group along the Walnut Creek greenway, from 0700-1130. One of the highlights turned out, ironically, to be a weather event! For about 30 minutes (from around 0800-0830), we had snow. And it was a wonderful little snowfall. The flakes were big enough to really be snow. And they were soft. It was a really magical moment for those of us who love snow. I hosted 4 Young Naturalists, and a couple adults. One of those adults, Ben Nickley, is a recent college grad and a new volunteer bird bander for us at Prairie Ridge. And, he’s an excellent birder. I cannot hear so well anymore, so it was great to have him along. Plus, he loves working with the public, of all ages, and so he had a fine time describing the various birds sounds to the young naturalist girls along. The Young Nat’s who came out were: Emma Little (15), Olivia and Vanessa Merritt (almost 17), and Abigail Coleman (13). They kept up a great spirit of birding, in spite of the challenging weather conditions. Indeed, it was an amazing ‘bird’ morning for us in that each of them found a really good bird, and all within about 30 minutes at one location. I found another, which made for 4 species for which these were the only reports for the entire count (pending a few more incoming reports). Two other Young Nat’s, Mia and Mya Velasco, came for an hour or so. One was nursing a cold and it was very brave of her to try and tough it out but in the end, the damp chill was just too much. Wisely, Mom took them home to watch birds through the windows at the feeders. One of our very first Young Naturalist’s was on the count this year, but now as a co-leader. Kyle Kittelberger has been involved with birding, and Wake Audubon, for a decade or so (like some of the others above, he began at an early age). It’s wonderful to see this “return on investment”. Kyle, along with Brian Bockhahn, took kayaks and paddled Swift Creek from Old Stage Road to the upper marshes of Lake Benson. Now, as you can imagine, this affords some sightings of things most folks are simply not going to see otherwise. They got a high count for Wood Duck, and a few neat birds that are the only reports thus far for the count: Herring Gull, Am. Woodcock, Horned Grebe, and Am. Coot. They also had Fish Crow, one of only two reports (we had the others at Walnut Creek). Again, it’s wonderful to see the youngsters coming out and being involved, and then return to take the lead for an area. Now, for the Walnut Creek gang…….. first, fairly early on, Abigail spotted a sleek shape zipping overhead while we were all looking another direction. Fortunately she got us on it quickly – it was moving east fast. But Ben and I got the binos on it and could readily tell it was a male Merlin. We hardly ever see this species on this bird count. 20 minutes later, I spotted some blackbirds fly up alongside the State Street bridge. Walnut Creek count area is THE place where we consistently get Rusty Blackbird, so we are always on the lookout. The lighting was terrible, but we were able to re-position and indeed confirm that these were 5 Rusty Blackbirds. But, they quickly flew off; very frustrating as not everyone got a very good look at them. And we did not see any more the rest of the morning. One rather amazing sight that took us to the bridge in the first place, was ~60 Eastern Bluebirds! I’ve seen small flocks of bluebirds, but never this many in one tree. They descended into a large bunch of Climbing Euonymus to gorge on the fruits, and some of the Privet fruits just below. Both of these plants are non-native and highly invasive but bear a fruit that some of these birds really like. Thus, the seeds are spread and unfortunately the Walnut Creek area has some of the highest densities of these two plants I’ve ever seen in Wake County. Waxwings and robins were also chowing down, and just below, some Hermit thrushes. Then, the bluebirds bolted and I hollered “Must be a hawk!” Within seconds, one of the gang spotted an incoming Sharp-shinned Hawk, which landed right in front of us, at eye level! It was just across the street and as it sat there for a few minutes, we got great looks and I got a few decent shots. After this hawk departed, without a meal, Olivia spotted a small songbird below us in the shrubs within the powerline right of way. She commented “It’s an odd-looking one, like some warbler”. Indeed it was on both accounts. It was an Orange-crowned Warbler, my first in Wake County. It was a really nice plumage, where even the gray seemed vibrant. As it was right below us, we all got great looks. It was a bummer for me when it flew too far away before I could get my camera out. So, at and near the bridge, we found several species that are almost never seen on this bird count: the Merlin, Sharpy, Rusty’s, and Orange-crowned Warbler. The Sharpy, as a rare bird, is a fairly recent phenomenon. I’ve not read any definitive reasons for why it has become as rare as it has. But in our area, reports have dropped off a lot over the past decade or so. Then about 30 minutes later as we continued east along the greenway, Emma heard a strange sound that she alerted us to, feeling it was a Gray Catbird. We harassed that sound for 20 minutes, with playback and trying to penetrate a privet hedge that, in the end, was nearly impossible to penetrate. We never did find the bird but it did call a few more times, and Ben and I heard it well enough to agree it was a Catbird. During the lunchtime overview, it was the only Catbird for the count. And this is another species that we don’t always get. And then the day after the count, I got a note from a woman over behind Whole Foods that a Catbird was coming to her suet feeder and she saw it on Saturday. And, she’d had one last year on the bird count so we counted it that year as well! She may have had the only one in 2013. Interestingly, where Emma found the Walnut Creek Catbird is the same spot I found one (and managed to see it), in 2012. We now know that many birds have a very strong sense of “place”. Other studies have shown that indeed these are the same individuals that return again and again to the same spots, be it a breeding territory, migratory stopover site, or “home for the holidays”. At the end of the day, our groups had found 93 species, and it’s likely that a few more will be reported over the next week or so. A hearty thanks to all who persevered the very uncomfortable weather to make this a really interesting count for the species found. And a huge thanks to Wake Audubon board member John Connors for once again coordinating the group leader/participant assignments. Attempts to re-introduce nesting Peregrine Falcons to western North Carolina continue to be successful. Beginning in 1984 with the release of four captive bred falcons, the North Carolina Wildlife Resources Commission hacked (captive bred and released) Peregrine Falcons in several sites in Appalachian North Carolina through 1997. Western North Carolina has several sites suited for the birds, with many steep, exposed rock faces that the species prefers. Since then, NCWRC staff and volunteers have located several potential nesting spots and monitored them every year for Falcon breeding activity, recording the number of wild fledged young when the Falcons do nest successfully. 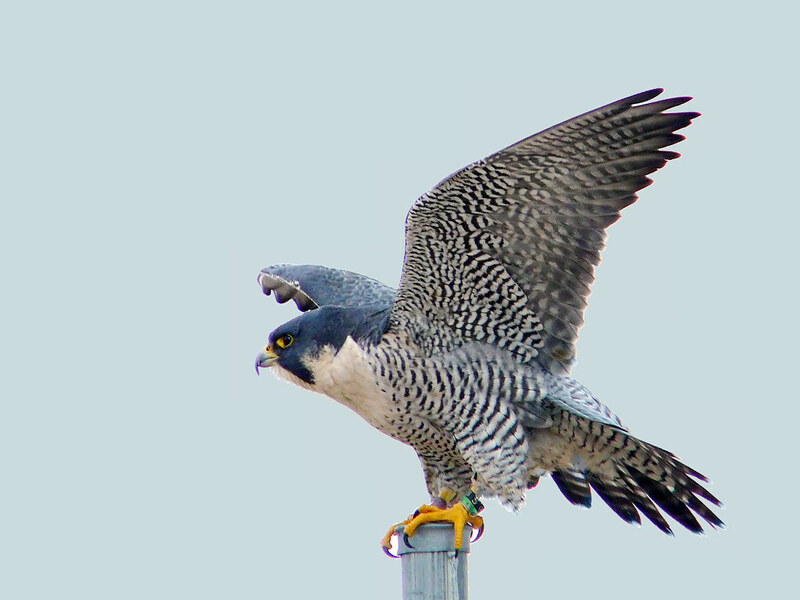 While Peregrine Falcon has been delisted from the Federal Endangered Species list, due to significant increases in the western part of the species’ North American range, it’s still protected by the state of North Carolina and remains an uncommon breeder in the Appalachians of North Carolina. Here’s a summary of 2010 peregrine falcon nest results for North Carolina as reported by Chris Kelly of the NCWRC. Many are great spots for birders who want to get a look at the birds too! * 10 of the 13 “known” territories were occupied this year. Falcons were not found at Moore’s Wall, Buzzard’s Roost, or Shortoff Mountain. * 2 “new” pairs were found this year: Pickens Nose and Victory Wall. * Nest success improved: 58%. Seven of 12 nesting pairs were successful in raising young. * Productivity improved: 1.25 nestlings/pair (based on 15 nestlings from 12 nesting pairs). * Second year females were found at three sites: Big Lost Cove, Grandfather Mountain, and NC Wall. The female at Grandfather Mtn was banded; first instance of a banded PEFA found nesting in western NC. Her state of origin could not be determined. * Observations: The female was a sub-adult based on plumage. * History: Falcons were first discovered at this site in 1997 and have reared nine chicks. They were successful for four of the first five years and were successful in 2008-09. * Result: Two (2) fledglings. * Observations: Nesting activity observed at Blue Rock early in season, then they were not often seen. Reece Mitchell observed fledglings in early June. Based on activity and white wash, suspect the birds nested at Blue Rock, approx 1 mi up the gorge from Chimney Rock. * History: First successful nest since 1990. * Observations: Pair on territory. * History: The pair at Devil’s Courthouse has been successful eight of the last eleven years, raising a total of 14 chicks. This cliff is a popular tourist attraction on the Blue Ridge Parkway and an easy place for birders to get a good view of the falcons’ breeding activities. * Observations: Second year, banded female on territory with adult male. Active at usual nest ledge, but not clear if they nested. * History: Grandfather Mountain is very remote with plenty of rock faces. A total of 9 chicks have been raised here. * Observations: Falcons were not observed during two four-hour observation sessions, along with several shorter observation sessions throughout the winter and spring. * History: Falcons returned to Hanging Rock in 2007 after a three year absence and have been successful three times (2001, 2007, and 2008) raising at least three chicks. The falcons face considerable competition from the many ravens and vultures in the area. * Observations: Falcons were seen on just one occasion near the nest ledge. * History: A pair has been in the gorge at NC Wall, Shortoff, or Gold Coast every year since reintroduction began. Although falcons were largely unsuccessful at first, they have produced 24 fledglings in the past eleven years. * Observations: Second year female and adult male on territory. * History: North Carolina Wall is the site of the earliest post-reintroduction nesting attempts in Linville Gorge (1987-2000). NC Wall and Shortoff Mtn are now the two closest known nesting sites, less than three miles apart. * Result: Three (3) fledglings. * Observations: Following a few years of nest failure, this site was successful this year. * History: In 1957, Looking Glass hosted the last known pair of falcons before the species was extirpated from North Carolina. A total of 31 chicks have fledged here, including 19 in the past eleven years. * Result: Two (2) nestlings. * History: Falcons were first successful at Panthertail in 1995. Since then, 29 chicks have fledged from this site. * Observations: Due to the I-40 rock slide closure, the first opportunity to visit the site was in May, late in the nesting season. Falcons were not observed on two visits, though there was fresh white wash.
* History: In 2004, a pair established a territory but nesting was not documented. * Observations: New nest ledge on the right side of the cliff. * History: The female was a sub-adult in 2008 and had the distinct blond wash of a young bird in 2009. * Observations: New nest ledge on right side of the cliff. * History: This enormous cliff has been the most successful peregrine falcon breeding site in North Carolina since 1984. A total of 45 chicks (28 in the past ten years) have fledged at Whiteside. * Observations: Pair on territory. Lots of vulture activity near the eyrie. * History: The pair nested successfully in 2007. Chris also checked a few secondary sites this year. These are sites where there is decent cliff nesting habitat, but no records (recently or ever) of nesting peregrines. * Observations: No clear view of the eyrie. Adults active at site all spring. Could hear at least two young calling. Later observed one fledgling at a time flying. * History: A birder reported PEFAs at this site in 2009. Pickens Nose was historically used as a hack site during PEFA reintroductions. * Observations: Two young observed in nest before leaves blocked view. * History: Falcons were observed nesting here in the 1990s, then moved to Devil’s Courthouse. In June 2009, NCWRC observed an adult PEFA on territory, but it was too late in the season to determine if nesting had taken place. Our Christmas Bird Count in the News! Come help us count birds on Saturday Dec 19 at spots around Raleigh/Cary! If you are interested in helping out, call John Connors at 733-7540 x602. Also, to celebrate there will be a potluck 6:30 Saturday night at Becky Desjardins’ house. For directions about that email bdesjardins@wakeaudubon.org.